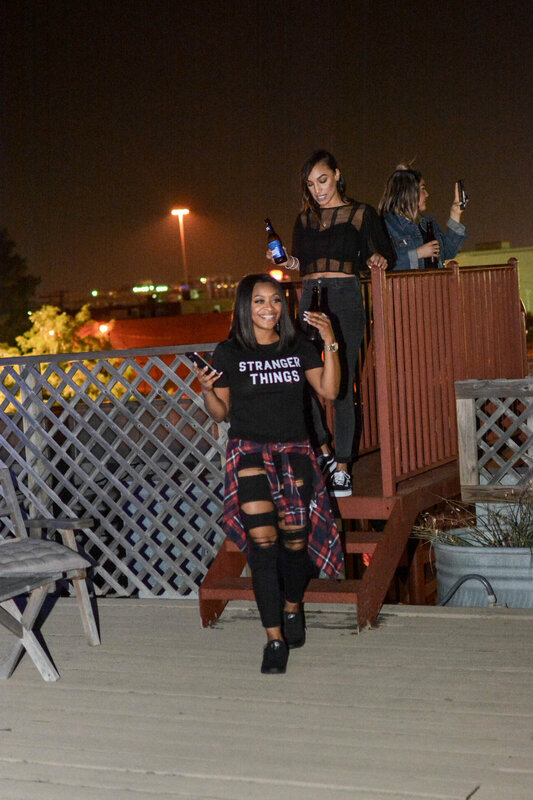 We Teamed With Bud Light For Friendsgiving! We all know the saying: you can’t choose your family, but you can choose your friends. “Friendsgiving” is a tradition dedicated to celebrating those we choose to spend a majority of our time with. Surrounding the Thanksgiving holiday, a host invites their closest friends over for a time of community building, great conversation, and delicious food. For us, the idea of our first CNK Friendsgiving started in September when we were pondering ways we could bring together women in Dallas, give them some tangible #Chickspiration, support our fellow girl bosses, give back to the community, AND devour some good eats. I talked about the idea in-depth in our November Chickspiration Newsletter - click here to get the skinny. 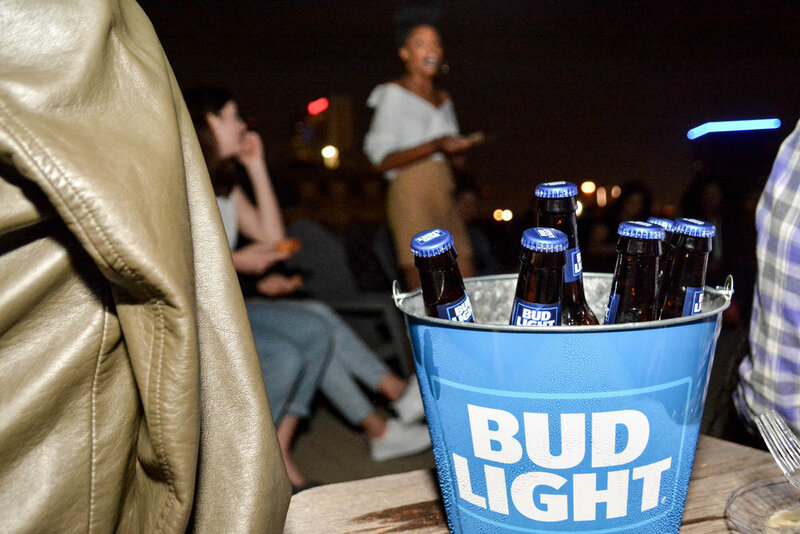 Luckily, our friends at Bud Light were on board with the idea and helped us curate a litty evening full of love, laughter, and all of Bud Light we could drink - and eat. Our evening started with a little bit of mixing, mingling, and all of the good music courtesy of Dallas Mavs DJ and CNK vet, Poizon Ivy. As Ivy spun, our guests were treated to hors d'oeuvres prepared by Chef Gabrielle McBay. Mini Chicken and Waffles and Brussel Sprout skewers were on the menu as we snapped shots in the photobooth and enjoyed ice cold Bud Light to kick off happy hour. After happy hour, we ventured up to the dining area and, let me tell you, everyone was ready for the goods Gabby prepared. Since this was Friendsgiving, our amazing Chef went in overtime to provide guests with a meal that would rival their actual Turkey Day menu. Lobster and Shimp Mac and Cheese (!!! ), Autumn Chopped Salad, and Loaded Mashed Potatoes were paired with a few dishes that even featured a splash of Bud Light including Beer and Honey Chicken Skewers, Beer Can Smoked Turkey, and Cornbread with Bacon, Chedder, and Beer Butter. Aside from great food and great conversations, it was super important to me for us to have two things in particular: an opportunity for women to grow in purpose outside of that room AND a chance for us to give back to those who may be going through difficult times. We teamed with Tristen Paige, a local community warrior and CNK ride or die - who also partnered with us last year for a Sole Saving Shoe Drive - in order to give something back to the homeless community in Dallas. We asked our guests to bring a pair of new or gently used sneakers to the event to donate to those in need. One pair of shoes can change the day of someone who has gone without and we were blessed to partner with Tristen's company, Turning Paiges, to bring some happiness to the soul (and soles). 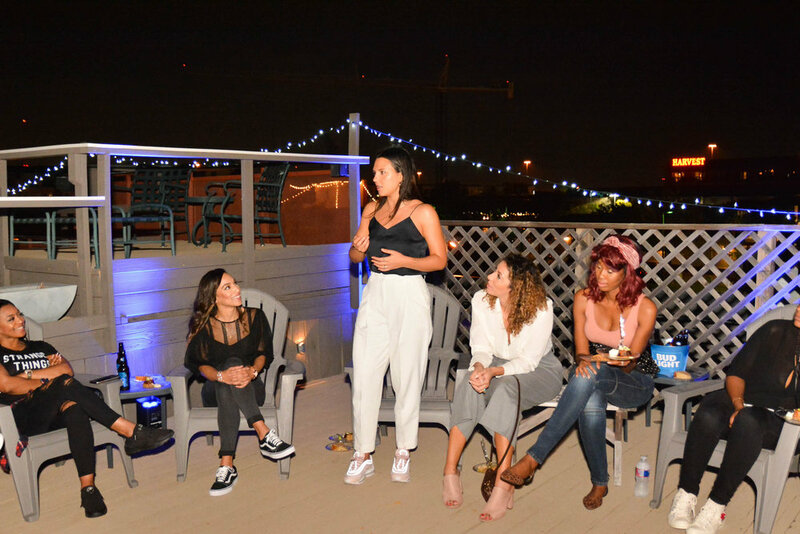 Our special guest - writer, author, and motivational everything Phoebe Lovatt, kept the evening going by not only speaking about her success journey but, by encouraging the ladies to utilize the tools at their disposal to grow their lives. In between good food and good vibes, Phoebe talked about her journey from adolescent go-getter to a that of a woman who travels around the world spreading love, light, and girl power through her business, The Working Women's Club, and a new book designed to provide a workable road map for women like me and you as we chase our dreams one to-do list at a time. 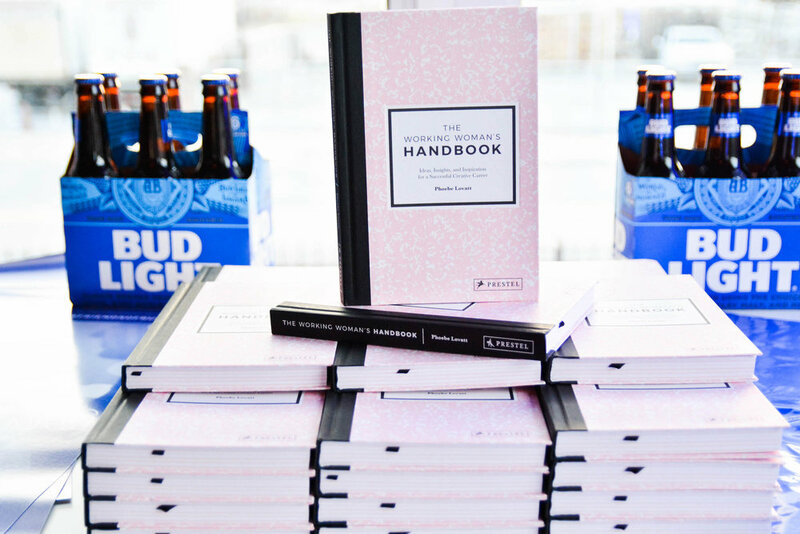 Each one of our guests left with The Working Women's Handbook: Ideas, Insights, and Inspiration for a Successful Creative Career and an opportunity to use the tools and do the work. Can you say #Chickspiration? Our evening ended with dessert on the roof in the eye of Dallas' beautiful skyline and an honest (and engaging) dialogue about friendship. We had such a great time this past Saturday and I'm so grateful to our guests for showing up ready for a little bit of friendship. Many thanks to our partners at Bud Light who brought this night to life. Get a peek at more from our evening in the snaps below and stay tuned as we roll out more from Friendsgiving in the coming weeks! …and two legit boss babes. We’re still tippin’ in H-Town and putting the pedal to our soles with a little help from the 3rd Ward art scene. Come along. Black excellence personified. Go inside the Nike NYC “QUEEN” event with Serena Williams and Virgil Abloh. Go inside our night at The Star as Nike Football rang in the 2018 Draft with a special collection. CNK's first Friendsgiving was litty and all LOVE. Nike kicks off a new NBA season with custom jerseys. community fun, and the Chicago Bulls. We lived like a Dallas Cowboy for the day, basically. 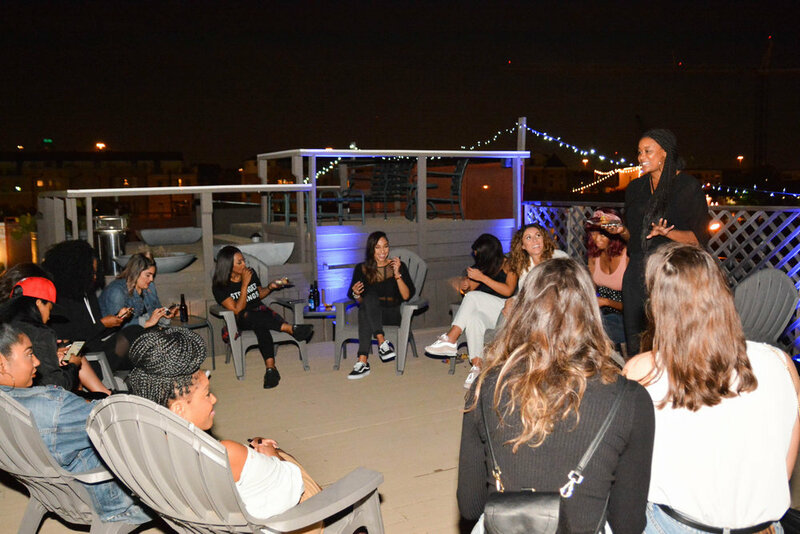 Because women love brunch, midi dresses, and Air Maxes.